Location is everything. When Willie Nelson and album producer Daniel Lanois set out to create a cinematic-sounding album, Teatro, they took over a disused movie theatre in Oxnard, California, and pictured its dusty glory on the LP sleeve. Recorded as-live in situ amid the red velvet seats, Teatro sees Nelson working extensively with his frequent collaborator Emmylou Harris, who joins him for duets and on backing vocals on 11 of the 14 tracks. The other major player is collaborator Daniel Lanois (producer of Bob Dylan's Time Out of Mind, Emmylou Harris' Wrecking Ball), who produces the album, plays guitar and bass, took the cover photo and wrote one of the album's songs, "The Maker," a stunning performance with glacier-thick vibe and where Red Headed Stranger masterfully meets the BrianEno/Lanois classic Apollo. Reinvention is key on Teatro, with Nelson revisiting a number of songs he first wrote in the 1960s, including 1968's "I Just Can't Let You Say Goodbye" and 1962's "I've Just Destroyed the World" and "Three Days." Though the songs are familiar, the sounds aren't: Teatro found Nelson experimenting with rhythms and flavors as never before, from the Spanish-influenced "Darkness On The Face Of The Earth" to the double-drum-kit percussive groove of "My Own Peculiar Way." 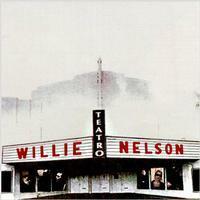 Accompanied by a nine-piece band that included Nelson's sister, Bobbie Nelson, on piano, the group conjure up an atmosphere informed by the howling harmonicas and distant mariachi bands of spaghetti western soundtracks, the end result being a Willie Nelson album quite unlike any other in his career, and one that reveals it widescreen vision through arresting sonic imagery. Originally released by Island Record in 1998, Teatro is issued here as it's never been seen before — on vinyl. I've had the CD of this album for a number of years and I always have enjoyed it very much. The LP version sounds better than the CD, has presence and great bass. The color of the vinyl is not the most attractive I've seen, it's a sick dirty yellowish. This album deserves to be more popular, it offers some very innovative arrangements. A few years ago I saw on TV the documentary that was made while the recording took place and it is very good, I would like to see it again.